As the Hispanic culture expands and melds more and more with traditional American culture, celebration traditions also cross over and mesh. You may walk into a Hispanic birthday party that looks no different than an American cookout, or you may find a heavier Latin influence in the array of foods, activities and decorations. These general traditions vary widely from country to country, and even in the United States. Hispanics may serve traditional food at a birthday party. Depending on their country's culture, relatives may make pulled pork, roasted or grilled meats and vegetables, tamales wrapped in corn husks or banana leaves, traditional rice dishes like Spanish rice or paella, chile con queso and regional or local foods like menudo, a hominy-chili soup. These traditional foods often sit alongside contemporary American picnics foods like hot dogs, hamburgers, steak and chicken. Hispanic families perform a number of American and Latin traditional activities and games. Younger children play pin the tail on the donkey, sack races or balloon tosses. 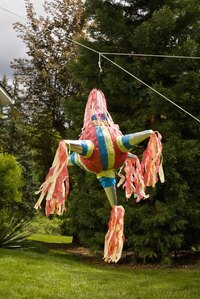 Most birthday party activities culminate in hitting the pinata, a colorful paper-mache animal or character filled with candies, goodies and sometimes money. Kids line up, and each takes a turn getting blindfolded and turned around three times before she tries to hit the pinata strung up between two trees. A relative sometimes pulls on the string to swing the pinata to make it more challenging for older kids. Traditional Hispanic birthday decorations include fresh flowers, banners made from colorful crepe or tissue paper, colorful tablecloths and message banners in Spanish or English. Families may buy or make colorful crepe flowers ahead of time to attach to table corners and line fences with. The crafter layers giant tissue paper squares atop one another, pinches the center of the square, securing it with pipe cleaner or wire, then fanning out the paper blossoms. Experienced flower makers may also glue crape paper to wire to create blossoms. When a Hispanic girl turns 15, she traditionally has a quinceanera to mark her passage into young adulthood. Traditionally, the celebration marks her maturity into womanhood, making her available for suitors, and it also reaffirms her devotion to God, connecting the celebration to Hispanic Catholic and Christian faith. The celebration typically consists of a mass or blessing at a church where relatives present the "quince," and perhaps a court rivaling the most elegant wedding courts. A reception and dance occur after, or just a small gathering at the quince's parents', godparents' or grandparents' home. Relatives gather for a late-night feast of leftover treats from the reception. What Kind of Food Is Served at a Quinceanera?